I can’t begin to tell you how many times I shook my fist at God and asked (more like screamed) “Why Me?” I’d recite to Him all the good deeds I had done. I certainly didn’t deserve such a cruel fate as benzodiazepine withdrawal. I had trusted my doctor that the pill he gave me was safe. That was the extent of my wrongdoing. The question “Why?” ate away at me every day. One afternoon my obsession with “Why me?” reached a crescendo. I literally fell on my bedroom floor and cried until there were no tears left to cry. When I got back onto my feet, something had changed. I didn’t need to know “why” anymore. Instead, I asked, “How?” How could I get through the day? How could my life still have meaning? I also asked, “What?” What could I do to have purpose in my life? What could I do to help myself heal? Do you know what the answers to all of the questions were? Service and love. In other words, give, instead of demanding to receive. From that day forward, things in my life started to get better, ever so slowly. I planted a front yard flower garden that attracted people from all over the neighborhood. They came and sat in my garden, total strangers, and told me their problems. I listened. I also wrote a positive message on a chalkboard on the fence every morning to inspire people (the start of my Soul Reminders). I fed the birds and squirrels and I blogged to help others in benzo withdrawal. I kept my heart open to the suffering of others, and did my best not to focus entirely on my own. I was always looking for ways in which I could help others. Research bears out that there is a healing power in being of service and loving others. Schmale and Iker, did a study of 68 women who were prone to a certain type of cancer.¹ They could predict which women would have carcinomatous changes on the basis of their feelings of helplessness. They discovered that women with high levels of helplessness were more prone to illness. What combated feelings of helplessness? You got it! Service to others and loving others. The question “Why?” is self-focused. It is all about our egos and what we want or expect. Shifting to asking “What?” and “How?” puts us in a better mindset. I know that in benzo withdrawal we are not at our best. Far from it. But that doesn’t mean that we have nothing to give. 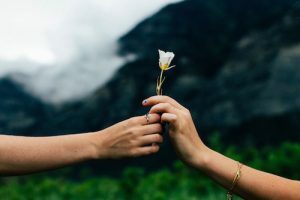 Even the smallest acts of kindness to others can lift us out of our feelings of helplessness and hopelessness, and it is the helplessness and hopelessness that are the most detrimental in recovering from benzodiazepine damage, in my humble opinion. They were for me! Shifting our focus away from our misery, and finding ways to help others and to love others, does wonders for our healing. I know, you’re thinking, I’m too sick to be of service. Get creative! Hand write and mail a letter to a friend or loved one who needs encouragement. Knit a scarf for someone. Watch Youtube videos that lift your spirits and write a thank you in the comment section, thanking the person who posted it. At the very least, you can ask your friends and family about their troubles, and listen carefully. Listening to others is love in action! We often spend so much time talking about our withdrawal symptoms, that we forget that others are struggling with their own problems. I know you can find ways to serve and to show love to others, even in benzo withdrawal. Post a few of your ideas for us all to enjoy and to be inspired by! 1. A.H. Schmale, “Giving Up as a Final Common Pathway to Changes in Health,” Advanced psychosomatic Medicine, vol. 8, 1972, pp. 20-40. I love this,and I will probably go back to serving others.I think for now I am learning how to look after myself.Serving others is what i have done all my life until the well ran dry.I am not working on changing the intention behind helping people and being more true to myself.First i have to get to know this unravelling part of me I have never known.I will continue to be kind,but serving others in a big way is on the back burner.Having said that even a smile,or a kind observation that is spoken can change someone”s world!! !Those are things,I can do!! I found and alot of fulfillment spending time with some elderly women who were recent widows -offering my time and companionship and a listening ear. I continue to do this now as they have become very dear to my heart. I agree with Wendy. I have been a compassionate server to others most of my life….it helps them and has always been very therapeutic for me. However now I am so absolutely exhausted I can barely take care of myself as I am alone and have no one to help me. Going through this has given me a much greater understanding and compassion for others sufferings so that is a good thing. Jennifer, I think your advise is wonderful but I think you are the exception to the rule the way you have the strength to ploy through adversity that you have when going through your withdrawal. Hopefully down the road I will be able to follow suit to a greater degree. You are certainly an inspiration that I will hopefully be able to follow in the not so distant future. I pray God eventually heals me so that I can return to serving others. I think the more we get know the good and bad in ourselves and the guidance of a higher power,God,our inner being,that source,the better we are at serving people in the truest sense.I think Jennifer may have a handle on that now,but the journey has brought her to a place where she can reach out,and I am so grateful for her.Yep she is in a place I aspire to be in time. I like to think I’m helping others by sharing my journey. Nearly all of my family and friends don’t “get it”, but I believe this is because they’re living in fear. We are benzo withdrawal pioneers. At some point in time, historians and everyday people will recognize our bravery. I enjoy volunteering at a local nonprofit theater it gives me a sense of giving back. I also recently donated to the Jimmy V Foundation in support of research to eliminate cancer. I stopped telling people about my benzo withdrawal because I don’t think people understand and I felt I was just wasting my breath. I am one year free of benzos and I can tell from your posts that we are definitely on the same journey! I agree with Jennifer that the way to get the focus off of ourselves is to serve others. For the first couple of months, all I could do was muster up a smile and some friendly words to family in the house. Then, after realizing so many people were praying for me, I added praying for others to my daily schedule. When I was finally able to leave the house, I started to accompany my husband to the place he volunteers. At first I was only an observer. Then I noticed that people brought sweet or savoury treats to share with the homeless and addiction recovery participants. When I was up for it, I would bring something that was store bought to share. When I was more able, I actually was able to make these from scratch and share them. You can see from my post that I started very small and then added to how I could serve only when I was able. There were days I would regress and couldn’t make things from scratch. I then resorted to store bought again. I am back to making some stuff from scratch and that is what I can do for now. I know I have come along way and still have another long way to go but there is progress and so I encourage you to do the same…start very small and add baby steps when able. You can do it….Jennifer did it and so did I. God wants us to help others who have the same struggles so I help this post will help someone!! Kathy, I humbly disagree. I am not special in any way, shape, or form. 🙂 We can find ways to love and serve others even if we are bedridden. Writing letters, knitting a scarf, etc. And loving/serving others in no way means that we are not taking care of ourselves. In fact, love/service is an *amazing* way to practice self-care, because it gives so much back to us. Such a touching article meant a lot to me! Jennifer, I have taken care of my grandson for 14 years and my husband for 45 years. During withdrawal nothing changed. Still did everything for everyone, like it was expected of me. Taking care of people, especially a 14 year old boy, has added so much extra stress and anxiety during my recovery. I’m not so sure it didn’t tack on an extra year to my recovery. I have anhedonia so bad that I get no pleasure from doing for others. I was raised to do for others but I don’t get ANYTHING from it right now, if that makes any sense. I am still waiting for the fear to leave and be replaced with love. I used to get so much pleasure from doing for others. Hope that feeling returns soon. I was just this week able to talk on the phone to my friend of 54 years. I finally picked up the phone when it rang and I’m so glad I did. She had done her research on Benzos and she was so helpful and understanding. Wish I had reached out to her 30 months ago but just wasn’t able to because of FEAR. It seems to be in the drivers seat for most of this journey. Can’t wait for it to, at the least, climb into the back. I would prefer that it exit my “vehicle” permanently! Thanks again Jennifer for another great post. Also Jennifer, would you say there is a difference between CHOOSING to do something for someone and HAVING to do for someone out of obligation? Oddly, my grandson is the only person I have ANY connection to. Eveyone else seems like people I sort of recognize but have no emotional ties to at all. If my grandson wants to come over I can just get in my car and go get him. But if we need to make a trip to Walmart, I have to wait for a window. I have no explanation for this. Thanks Jennifer. I help others by listening, sharing tips, sending links to doctors and resources to others. I make my husband a sandwich and my kids lunch. I feel very zapped of energy. I feel I need to conserve my energy at the moment but I am in the midst of acute. I pray it will be different as time goes on. I need to be careful w sharing my energy at the moment. Happy New Year, Jenn and fellow Benzo warriors! Here’s to a more comfortable, healthy & happy 2017. Happy healing! Same to you!! Jen I love your blogs…they bring a hope knowing someone has gone through this and made it out alive! Been a rough couple of months, bad depression,anxiety, fatigue, but the worse is the derealization which got worse this past week after getting an upper respiratory infection. Did way to much the week before Christmas now feel like I can’t do anything. Don’t even have the capacity to communicate, concentrate, feel numb!! But my God is a mighty God and I will continue to seek Him daily. My source of strength and refuge. It’s amazing how going through this will put life and mortality into perspective and the true reason we are here. I’m thankful to know that He is putting me through the fire for refinement to live my days closely walking with Him.